"Legends die hard. They survive as truth rarely does." Many famous urban legends are part of our current world. These urban legends are known as urban myths and even as urban tales. Many individuals are now starting to refer to these legends as “contemporary legends”. The stories that are considered to be urban legends are often described as a modern version of folklore. The stories that are shared are typically apocryphal based. This basically means that they have a hidden meaning or they are questionable among those that hear them. Those that share the stories surrounding the famous urban legends of our world most often truly believe that what they are saying is true. We often hear these popular stories in news stories, magazines, and other types of media. One of the most popular forms of transmission for these legends is on the internet, most commonly through email. Urban legends and myths are quite popular among many as they often are expressed as complete stories that actually include the elements of both a standard plot and very realistic characters. The stories that are shared between one or more individuals often include many realistic and emotional elements. Examples of these include the mysterious, the horrific, the fearful, and in some cases, the humorous. Many of these stories will be retold as a means of providing warning to others, while others incorporate the elements of superstition or facts that should be dispersed on a wide scale basis. There are many types of urban legends that surround events that are considered to be unrealistic, but the facts seem so realistic that many individuals believe them. These legends typically include cases involving unidentified flying objects and even ghosts and poltergeists. When individuals share urban legend stories they often do so in such a way that the listener believes it happened to someone that the storyteller personally knows. When a narrative carries strong power, the story that is spread from one individual to another seems to hold credibility – despite the fact that many actually exaggerate and edit stories to their own appeal when sharing them with others. It is not at all to discover that stories pertaining to missing persons, various types of crimes, and stories that are believed to have happened to several different people actually never happened at all. In many instances, it is challenging to determine which stories are portrayed are realistic and which stories are unrealistic. Here at Greatest Unsolved Mysteries, you will discover many different famous urban legends that are still in circulation today. The Legend of Bloody Mary is perhaps one of the most popular famous urban legends of the world. 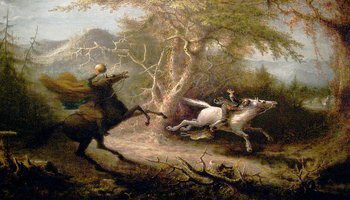 While many people consider the story of the Headless Horseman fictional, there are several that believe that the story is in fact, based on some truth. The tale of Spring Heeled Jack is a famous urban legend that is quite popular in England.